When you push your clutch pedal down and when you try to shift you get gear grinding, you probably need a new clutch. If your clutch pedal is low when this happens, you might have a bad pressure plate, master cylinder or linkage issues that prevent the clutch from being completely disengaged. Most manual transmission shifting problems aren't with the transmission itself, but more often with a clutch, flywheel or clutch master cylinder. Bad pressure plates and time cause flywheels to warp. Resurfacing insures the longest life for your new clutch. 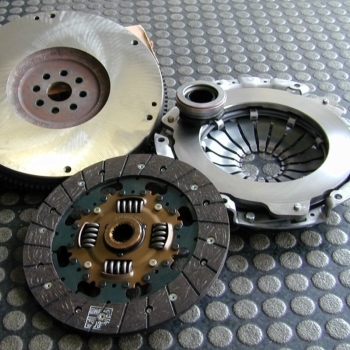 If you do need a new clutch, the pressure plate will also need replacing. Conversely, if you need a new pressure plate, it makes the most sense to replace the clutch too because they work together to disengage the transmission to allow shifting. The labor to replace these components is more that the cost of the parts. You wouldn't want to do one only to have the other fail soon after the repair. It is common for a high mileage vehicle to have a warped flywheel. The flywheel is what the clutch presses against to engage the engine to the transmission. If the flywheel is warped, the new clutch can wear prematurely. That is why you need flywheel resurfacing if it is warped. This assures you the most power is being transmitted to your drive wheels. After a clutch/pressure plate/and/or flywheel resurfacing, you will be able to enjoy the vehicle performance you may have long ago forgotten. You can call us, mail us, or email us. Please fill out the following form to email us. If you provide us with your phone number, a professional transmission expert will be happy to call you.